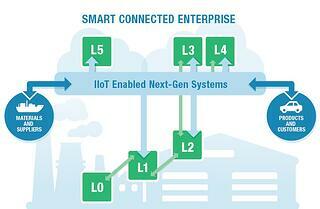 LNS is vocal about how IIoT will influence the next generation of control systems. On August 23, end users will have a rare opportunity to directly impact the evolution of control systems at the Open Automation Industry Day, hosted by ExxonMobil Research and Engineering Company (EMRE) and The Open Group. According to LNS Senior Research Analyst Dan Miklovic, “If you want to invest heavily in driving the change, or just want to make sure you don’t get backed into a corner with an outdated, inflexible control systems model, this event is a mechanism to get looped in on the 5 to 10-year control roadmap. Any company with a substantial investment in automation and control needs to stay informed and this is one way to get in on the ground floor.” Get information at on this event here. During LNS analysts’ conversation with Siemens last June we heard about a new organizational structure that placed Product Lifecycle Management (PLM) and Manufacturing Operations Management (MOM) under their new Digital Factory Division. Now, less than 90 days later, the company officially announces version 6.1 of its Simatic IT eBR software, which is the heart of its manufacturing operation management for the life science industries. The new version enables easily implementation of paperless manufacturing solutions via two main features: new web-based master batch record (MBR) module to facilitate management of key process parameters, and native integration with the Siemens automation layer (Simatic PCS 7 process control system and HMI systems). To learn more about it click here. According to Fortune Magazine, Apple has bought a machine-learning startup called Turi in a deal reported to be worth around $200 million. It’s not Apple’s first acquisition of this kind, though. The company has made around 15 acquisitions since early 2015, several of them similar and related technologies. Manufacturing and industrial-related businesses could certainly benefit from the investments and R&D, albeit indirectly. As President and Principal Analyst Matthew Littlefield wrote in a recent blog post, “All of this work [developing a business case] may have missed one of the most important and quickly maturing technologies in analytics, Machine Learning (ML).” In typical Apple fashion, the Silicon Valley company is doing much of the early legwork that will pave the way for other innovators and technology companies. Read more about it here. Bandwidth Drama Takeaway: Plan Now or Throttle Later? Digital traffic turned into a big problem for HBO and Game of Thrones fans back in June, when thousands of customers were left with blank screens and angry feelings due to a digital traffic jam. As consumer-focused industries and services (belatedly) labor to solve problems, industrial companies may have a slightly wider window of opportunity to plan for the exponential demand that will come as a result of Digital Transformation and the Industrial Internet of Things (IIoT). Rip-and-replace is never prudent – in anticipation or as a reaction; pragmatic executives keep an eye on emerging technologies as they make plans to meet business objectives today, 5, 10 and even 15 years or more from now. You can find more about this here.